A century of great oration is collected in this unique volume, from the stirring speeches of leaders such as Winston Churchill and Douglas MacArthur to the revolutionary words of Martin Luther King, Jr., and other reformers. Richard Greene has been called "the Master of Charisma" by the Sunday Times of London. He coaches presidents, prime ministers, CEOs, celebrities, and sales professionals on public speaking, and has appeared on "Nightline," "Good Morning, America," CNN, ABC, NBC, CBS, and the BBC. He covered the 1996 and 2000 Presidential conventions as a political speech analyst for MSNBC and FOX News. Florie Brizel is a former TV producer whose expertise includes speechwriting, public relations, and marketing for individual and corporate clients worldwide. "Men since the beginning of time have sought peace... all in turn have failed, leaving the only path to be by way of the crucible of war.... If we do not now devise some greater and more equitable system, Armageddon will be at our door," warned General Douglas MacArthur in his legendary 1945 radio address after the surrender of Japan. 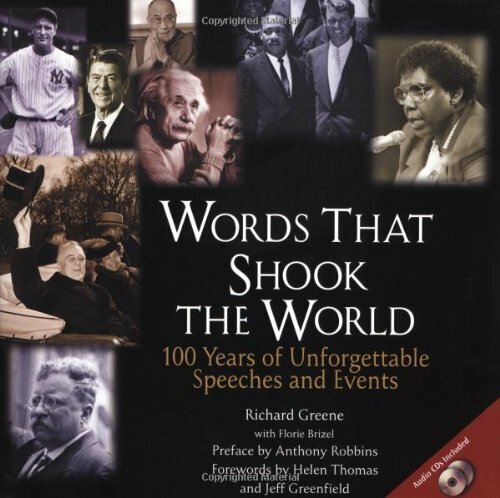 His and other great speeches of the past century by the likes of Eleanor Roosevelt, John F. Kennedy, Princess Diana and others are reprinted (with some abridgment) in Words That Shook the World: 100 Years of Unforgettable Speeches and Events. Editor Richard Greene, a speech analyst and consultant, offers blow-by-blow analysis next to each paragraph of the speeches, explaining what it is about the rhythm and diction of the sentences that makes them so effective. Two accompanying audio CDs offer original sound clips.